Last year I had an epic fail in attempting to create a molasses cookie recipe that he could have with his dietary restrictions with PKU. But sadly, they were gross and had to be thrown out. This year though - THIS YEAR - I NAILED IT! And not only did I nail it, you can’t even taste the difference between the two cookies! Can you hear the Angels singing? I could! Hehe! 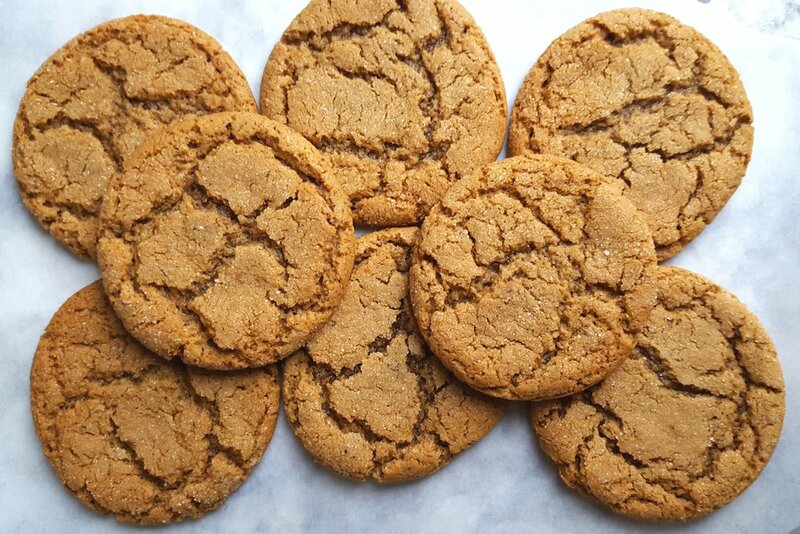 But seriously, it was a win in my “PKU Test Kitchen” because not only did they come out looking almost identical to the regular molasses cookie, my sweet boy DEVOURED it and wanted more! For those not aware of Tristan’s metabolic disorder, he is essentially a low-protein, semi-gluten free, vegan. You can learn more about his PKU HERE. But for Tristan, his diet is very limited on what he can eat. It is hard at times when there are so many treats and goodies around at the holidays because I want him to be able to enjoy things as well. So today was a HUGE win for us because now we can ALL have our favorite Christmas cookie together! Melt crisco and butter substitute in sauce pan over low eat on stove. While butter substitute is melting, place sugar, molasses, and egg substitute into mixing bowl. Once butter substitute has melted, turn mixer on low and slowly pour and mix until ingredients are incorporated into each other. Once wet mixture is incorporated into each other, add remaining dry ingredients and mix on low until all is mixed. Refrigerate for 4 hours or over night. After dough has been refrigerated, preheat oven to 350F degrees. Roll dough into 1-inch balls in the palm of your hand and dip half into sugar. Place cookies on cookies sheet approximately 2-3 inches a part. Cookies will spread while baking. I baked 12 cookies to a sheet. Bake for 10-12 minutes, or until tops have cracked. Do not over bake! Let cool for 3-4 minutes on cookie sheet before transferring to a wire wrack. Store in an airtight container to keep fresh!